Kubernetes allows you to easily integrate different types of services on one cluster: From a developer’s standpoint, apps typically incorporate multiple types of components. Any complex solution will use long-lived services, short lived functions, and stateful services. Having all the options in one Kubernetes cluster lets you use the right tool for each job and still be able to easily integrate things together (whereas separate clusters will add both an operational and cost overhead.) FaaS works best in combination with other apps that runs natively on containers, such as microservices. For example, it may be the right fit for a small REST API, but it needs to work with other services to store State, or be suitable for event handlers based on triggers from storage, databases, and from Kubernetes itself. Kubernetes is a great platform for all these services to inter-operate on top of. Kubernetes is great for building on top of: it provides powerful orthogonal primitives and comprehensive APIs. You can benefit from the vibrant Kubernetes community: All the work being done in the community on areas such as persistent storage, networking, security, and more, ensures a mature and always up-to-date ecosystem of enhancements and related services. This allows Serverless to take advantage of things like Helm, Istio, ConfigMaps, Secrets, Persistent Volumes, and more. Kubernetes allows container-based applications to scale reliably and in a cost-effective manner – by clustering the containers within a container manager where they can be scheduled, orchestrated, and managed. This reduces operations cost considerably when compared to not using a cluster manager, and greatly increases the reliability of your service. Kubernetes’ scheduler and cluster management, service discovery, networking – are all required in a FaaS framework, and so by running Serverless on top of Kubernetes you avoid having to re-invent things, and can focus on the serverless functionality, leaving container orchestration functionality to Kubernetes. While Kubernetes is a great underlying orchestration layer, it does require extensive set up and management overhead. There is still a significant amount of software “plumbing” to be built before deploying a Serverless application, even with Kubernetes. The code/function has to be written, the code has to deployed, containers need to be built and registered and then various configuration steps on Kubernetes (e.g. deploy, service, ingress, auto-scaling, logging) have to be carried out. Kubernetes is so robust and complex to manage, that it poses challenges to Ops in terms of the learning curve and the operational complexity – that hinder Serverless adoption, particularly for on-prem environments. 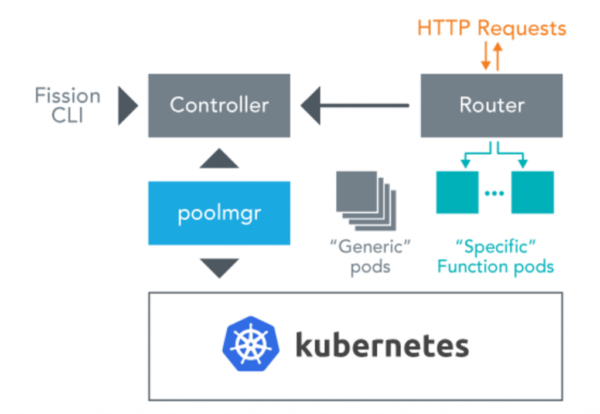 What is needed is a solution to help with reducing the time and effort spent on “plumbing” the Kubernetes infrastructure required for developing Serverless applications. What would be ideal for developers is to have a framework where functions are deployed instantly with one command. There should be no containers to build and no Docker registries or Kubernetes clusters to manage. Developers should focus only on “the code”, while the complex steps involved in packaging, deploying and managing applications are automated by the Serverless framework while being entirely native to Kubernetes. Enters the open source Fission. 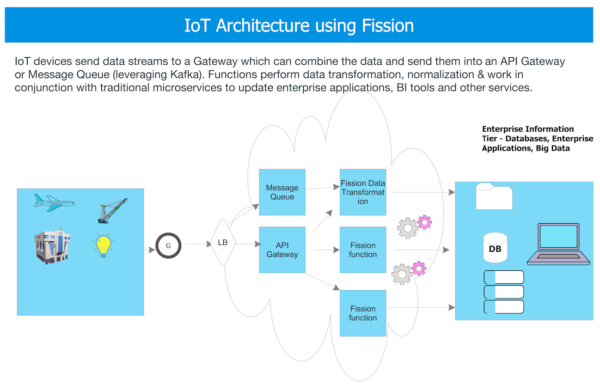 Built by Platform9 and other contributors in the Kubernetes community, fission focusses on developer productivity and accelerating time to value. Fission enables developers to write efficient, portable and high-performance Serverless applications that instantly run on any Kubernetes cluster – on-premises or in the cloud. Developing more complex applications leveraging the Serverless paradigm requires the composition of interacting Serverless functions. This has typically been a complex and time-consuming process. Fission Workflows enable the easy orchestration of a sequence of Serverless functions to create an application – which significantly accelerate the creation of Serverless apps. Workflows present an elegant way for integrating and composing serverless functions together by defining a sequence of tasks, decisions and loops. Functions can be composed either in sequence or in parallel. The output of a function can be sent to the inputs of another function, “if” statements, loops, and even functions that operate on other functions. Power & Utilities – where streaming data is intercepted and analyzed to perform demand forecasting, equipment reliability management, etc. Advertising – serving mobile & online users with instant & relevant offers based on their browsing history, location and buyer characteristics. Financial Services – such as banking and trading applications – where various facets of user data are populated in real-time in the customer portal. Let us examine some design patterns for common industry use cases to see how Serverless can help you accelerate innovation and software delivery for key event-driven applications. We’ll be using the open-source Fission serverless framework for illustrating these architectures, as it is the most flexible and is not locked to a specific cloud provider or related services, so that your apps can run anywhere. You can swap Fission with any serverless/cloud offering of your choice, too! The second function will run in response to the normalized file being placed in the NoSQL database. It will read the contents of the file, perform computations as needed (based on the use case) and then invoke microservices that perform functionality such as sending the data into a Data Lake or a Data Mart for further analysis. 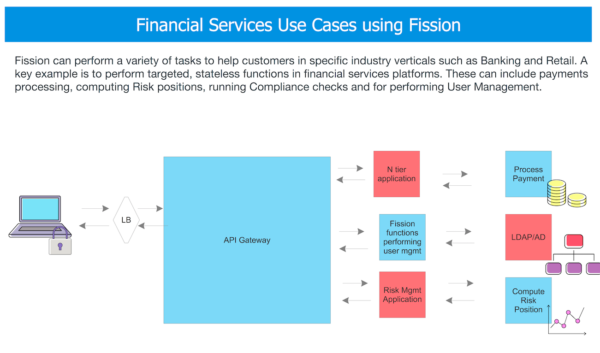 In the financial services industry, critical tasks such as payments processing, compliance checks and risk metrics can be calculated in real time using a Fission-based Serverless architecture. 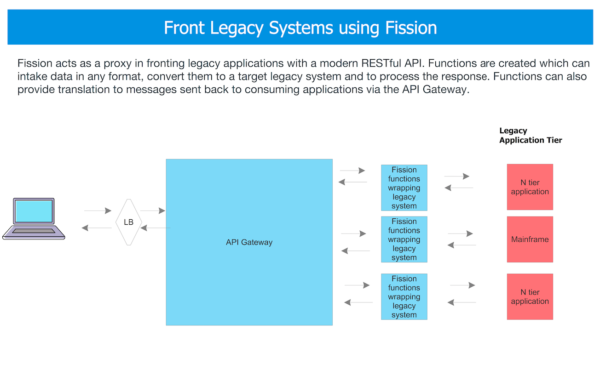 The overall flow in a financial application can be orchestrated using Fission:Developer deploys Fission functions as a shared capability across several applications that are the frontend to a variety of payment processing gateways. These applications handle user authentication, registration & collection of payment related data. These systems also interface on the backend with a variety of databases that record transaction data. Fission functions are created to parse a given input data stream that has the following variables: user’s credit card data, location of the transaction, any other demographic information, etc. The first function can call a fraud detection API and based on the results of the check persist the data into an in memory data grid. Dedicated functions perform the appropriate logic as depicted, and if needed “report back: to the application. Legacy systems such as mainframes, N-tier applications are prevalent and deeply rooted in industries such as Banking, Insurance, Retail, and more. Oftentimes it is not possible to simply rip and replace these systems (due to complexity, business dependencies, time it would take to re-architect, as well as the fact that often these legacy systems still perform quite well and have mature usage patterns.) 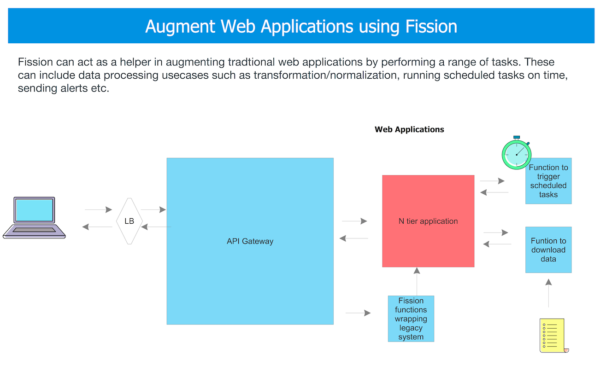 To ensure interoperability with modern interfaces, such as web services and mobile applications, Fission functions can provide standards-based API wrappers around these systems. Across-industries, we see applications increasingly infusing business processes and big data with Machine Learning (ML) capabilities. From fraud detection, customer behavior and pipeline analysis, virtual reality, conversational interfaces, chatbots, consumption trends, video/facial recognition, and more — it seems that ML (and AI) is everywhere. For most companies, ML and Predictive Analytics initiatives have typically been silo’d to a specific project within the organization. To realize the real value of ML, it’s advantageous for the data, learnings, algorithms and models to be shared across applications. 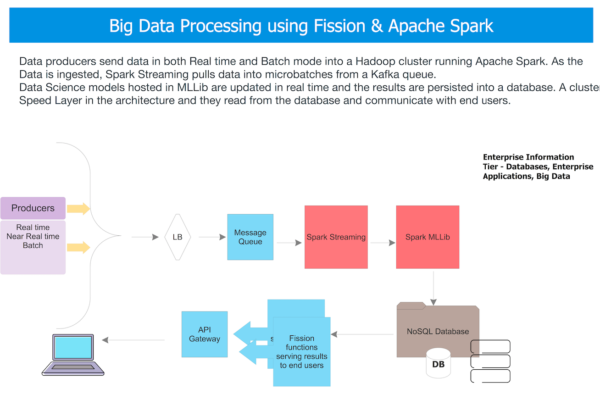 Fission, in conjunction with technologies such as Apache Spark, enables you to provide the data of stream processing and trend predictions to be consumed by a variety of end users/applications. Spark Streaming is used to ingest this data in micro batches, typically based on a time window. This data is stored into a data lake for batch analysis as well as sent into a Spark MlLib runtime where different predictive models are stored. These models are based on general purpose ML algorithms that run on Spark. These include both supervised and unsupervised algorithms – e.g. clustering, classification algorithms, etc. Once the results of the model are written into a NoSQL database or an in memory data grid, Fission functions are triggered. These functions do a range of business-critical functionality. For example: updating business analytics dashboards, sending real-time customer offers & alerting customer agents. Serverless technology has immense industry mindshare and is emerging as the hottest trend after Kubernetes. However, as with other transformational technologies, significant concerns remain around lock-in, scalability and ecosystem integration. Open source Serverless solutions help industry verticals solve their pressing business challenges using a highly flexible, state of the art, and standards-based FaaS platform that can run anywhere- on premises and on any public cloud.